The term “automatic transmission” means a lot of different things to a lot of different people. But to you it generally means just one thing: put it in gear and go. 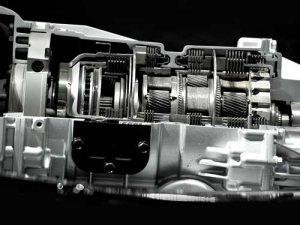 No shifting gears… the transmission does the work for you. That’s because automatic transmission is a broad term to describe a lot of different systems built since the late ’40s. Back then, an automatic transmission often had only two speeds: low and high. They didn’t provide a lot of power and they weren’t all that efficient. But they were easy to drive, because they decide when to shift. Today’s automatic transmissions look nothing like the automatics of yesteryear. And they have four, five, six speeds and more. In fact, 8- and 9-speed automatic transmissions are just beginning to appear on the road! And efficient! The addition of a lockup torque converter and computer controls has turned the sloppy automatics of yesteryear into a powerful, efficient machine. In fact, most people would be hard pressed to squeeze better gas mileage out of a standard transmission than you can expect from one of today’s automatics. Of course, all that technology comes at a price: complexity. Today’s automatics are far more complex than those of twenty or thirty years ago. And that can be a problem when they aren’t working they way they’re supposed to. When that happens, you’ll be glad you have Cottman in your corner. Your local Cottman center has been specializing in automatic transmissions for over 50 years. They’ve seen the changes and they’ve made it their business to keep up with the latest technology. So, whether your car has an old, two-speed powerglide or the latest ZF 8-speed, the technicians at your local Cottman center have the know-how to analyze the problem and fix it right… the first time. And you can be sure that, when you bring your transmission problem to a Cottman center, you’re bringing it to a shop that specializes in automatics; it’s the business model we were founded on, and one we take pride in. Having transmission troubles? There’s no place better to take your car than your local Cottman center; call today!